This week Springer Nature’s figshare integration reached more than 450 BioMed Central and SpringerOpen journals. Upwards of 19,000 articles now have their supplementary materials (additional files) stored in figshare and previewable within the journal article. As a result these research outputs are now available in a more citable, shareable and discoverable manner. In December 2016 Springer Nature (our parent company) introduced this new approach for additional files at BioMed Central and SpringerOpen journals. Each file receives a unique DOI and richer metrics on readership and usage, while the files themselves are displayed in-article via the figshare widget. Every journal involved also benefits from a customised, branded figshare portal – its own general purpose data repository. The figshare platform supports over 650 file types, enabling datasets, code, video and images to be previewed on the platform and via the in-article widget. In many instances this removes the need for downloads, specialist software or even opening a new browser window to view the file (see the example linked above). 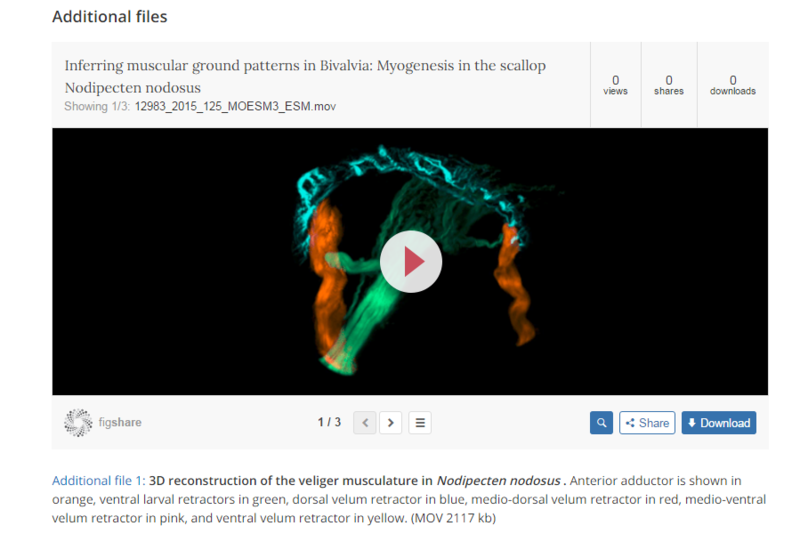 Compared to general embeddable video players, YouTube for example, figshare allows not only the citation of content and a specialist academic metadata structure, but a relatively unrestricted reach to audiences worldwide. This initiative is part of Springer Nature’s wider effort to enable authors and journals to publish the best research and support more discoverable, accessible and reusable research data. In addition to the figshare solution this includes the implementation of a standardised set of research data policies supported by a dedicated helpdesk. As a result journals can more easily facilitate data sharing and compliance with funder and institution requirements. As well as making figshare support for supplementary materials available to other Springer Nature publications, we’re evaluating novel solutions to support authors in publishing their data. This includes support for submission of large datasets to journal figshare portals (such as this 14Gb dataset associated with a Genome Biology research article), and other bespoke data publishing services. The research data support helpdesk is available at researchdata@springernature.com for advice on any of these initiatives and for authors or editors with data intensive publications and projects. Graham is Research Data Editor at Springer Nature, working to develop and promote data publishing tools and policies across the organisation. He has previously worked in similar data-focused roles at the Natural History Museum and ATP Media.